Nicky Brett won the International Bowls Open to become world number one. 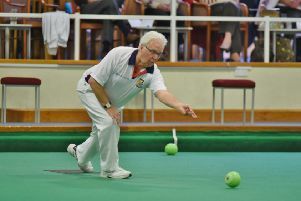 Yaxley’s Nicky Brett claimed his third world ranking title with a masterful display in the International Bowls Open in Blackpool today (March 6). The win means Brett, who works as a plumber in Yaxley, is now ranked world number one. Third seed Brett beat six-time world champion Alex Marshall MBE 12-4, 9-8 in the final to win this particular title for the first time. He had to survive a tense final bowl from Marshall who missed a golden opportunity to take the three shots he needed to take the final into a tie-break set. Brett had kept his nerve to claim two shots on the penultimate end of the second set to go 9-7 ahead. Brett was described as the ‘Ginger Ninja’ at the presentation ceremony. He performed a cartwheel to celebrate a terrific win and his new position as the world’s best player. “I’m quite pleased to say the least,” Brett said. “I’ve now found a way to win when I’ve not been playing sensational bowls when in the past I’ve found a way to lose when playing well. Brett started the tournament as world number three and looked on course for an easy win against Dawes when taking the first set 10-1 and then strolling into a 5-1 lead in the second set, but Dawes scored eight shots without reply to take the match into a tie break. Dawes took the first end, but Brett hit back with successive singles to sneak through. Brett beat Damien Doubler (9-7, 10-5) and his regular doubles partner and City of Ely clubmate Greg Harlow (9-5, 6-6) on his way to the title.